England all-rounder David Willey has withdrawn from the Indian Premier League with his wife due to give birth. The 29-year-old's wife Carolynne is pregnant with their second child. "My wife's had a bit of a tough time, so I'm having to make sure she's alright," Yorkshire's Willey, who had been set to join up with Chennai Super Kings, told the club website. "Chennai were very understanding and very supportive, as Yorkshire have been as well." Willey joined Chennai as a late injury replacement in 2018, but only played three times for the franchise. "It's never an easy decision. But, nonetheless, it's the right decision," he added. "I need to put my family first at the minute, and cricket's secondary to that. We'll get that sorted and then I can concentrate on cricket." 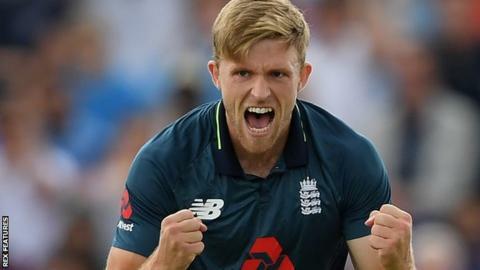 Willey did not feature in any of England's recent one-day series against the West Indies, but is still hopeful he can play in this summer's World Cup. "Over the last 18 months to two years, it's shown when I'm playing regular cricket I play my best cricket," he said. "To play in the build-up to that will be brilliant for me, and hopefully it puts my name at the forefront of the captain's and the selectors' minds. "Nothing's nailed on (with World Cup selection), and you never quite know where they're going to go."